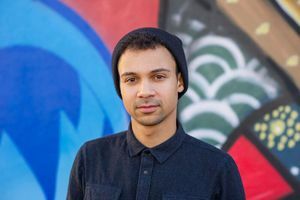 Samuel Sinyangwe " is an American policy analyst and racial justice activist. Sinyangwe is a member of the Movement for Black Lives and a co-founder of Mapping Police Violence, a database of police killings in the United States, and Campaign Zero, a policy platform to end police violence." 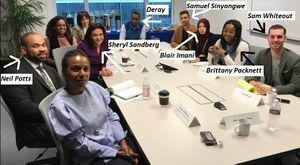 Deray Mckesson meets with Facebook officials Chief Operating Officer (COO) Sheryl Sandberg, Neil Potts, Blair Imani, Brittany Packnett, Sam Whiteout, Samuel Sinyangwe and others to discuss "safety, activism, Russia, & a host of ideas about moving forward" in October 2017. 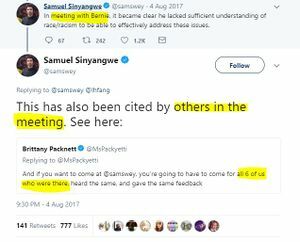 DeRay Mckesson tweeted in October 2017 that he met with Facebook Public Policy Manager Neil Potts and Facebook Chief Operating Officer (COO) Sheryl K. Sandberg along with radical left activists Blair Imani, Brittany Packnett, Sam White, Samuel Sinyangwe and others to discuss "safety, activism, Russia, & a host of ideas about moving forward." This page was last modified on 14 April 2018, at 08:41.